North….Two weeks back in Maryland – land-based, filled with work, work, work…taking care of my Dad, family stuff, hooking up with a few friends…and a swim debut.That’s right – swim. My least enjoyable sport. But, since I am in training for a sprint-TRI – I guess I need to find my way back into the swim lane. 3 days at the Martin Luther King Swim Center — and I was up to 40 laps (sidestroke…the only stroke I know how). OK, I guess I can do this as long as I don’t have to put my face underwater. I packed my swimsuit for Charleston…just in case a swim opportunity arises. 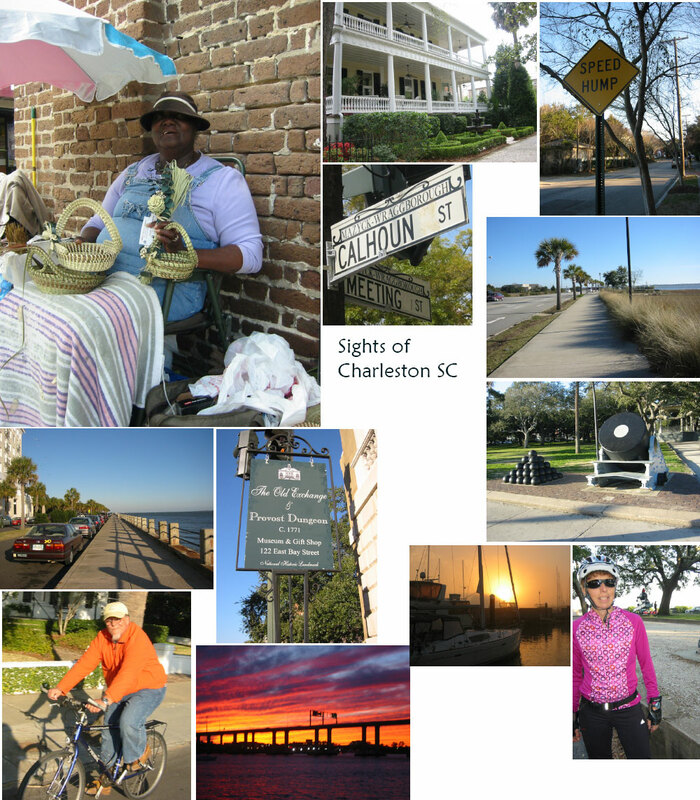 …meets South ….My road trip to Charleston was uneventful for a change (whew!). I made 2 stops…first stop at the Welcome Center in North Carolina. Spent an hour updating a document – and sending emails. Next stop at EXIT 181 in South Carolina. Sound familiar? Yep, it is the same exit and Hess Station that possessed my VW Beetle a month prior. Had to rid the spot of bad Ju-Ju — but just to be safe, kept my keys, purse, cell phone and food on me at all times – and rolled down the windows just for added assurance.Arrived at the City Marina at approximately 3:30PM…to a beautiful 70 degree day. Decided to go on a small walk….which morphed into a brisk high-energy walk along the perimeter of the Charleston Harbor to the opposite side of the peninsula. Two hours later…I returned to Cat Maudy – completely invigorated. Charlie is the high-tech welding man who fixed our rigging – and in the process became a delightful friend as well. Pat and Charlie had already made the “Italian connection” – and when Charlie started talking about food choices that he and his wife Kay make (She makes her own soy milk, tofu) – and they eat “greens” for breakfast….I knew we would get along fabulously! Charlie (from Charleston area) and his wife Kay (originally from Michigan) make you feel like you’re family. We sat down for sushi at 8:30…and proceeded to hear about Charlie’s experience with FIVE GUYS ( a Washington DC based hamburger and fries chain that has recently added a restaurant to the Charleston area). Apparently, Charlie and Pat had an earlier conversation about how decadent a burger and fries are (I think Pat is tired of eating healthy! )….and sure enuf – Charlie went to FIVE GUYS to experience the burger and fries deal. He apparently loved it. So much for that healthy food conversation we had a few hours prior. Irregardless, the sushi was phenomenal at Osaka – and very reasonably priced. We will be making another visit here. …with gale force winds, I decided that I ABSOLUTELY MUST combine exercise with my other favorite pastime…FOOD. Being on a dried fruit “kick” – I wanted to experiment with more fruit varieties – and thought maybe I would have good luck at the Whole Foods Market located in Mt. Pleasant. Going there… on my bicyle…was a breeze…literally. I was flying. Obviously I had an excellent tailwind carried me across the peninsula and over the Route 17 bridge. I barely broke a sweat – and was passing cars and busses along the way. I didn’t even need to downshift going UP the Route 17 bridge. Soon, I was going so fast on the descent into Mt. Pleasant – that I had to hit the brakes a ton — just to avoid going airborne when my wheels hit irregular surfaces on the bridge. I’m guessing it was a 10 mile ride total to the Whole Foods Market. I lollygagged for about an hour in the Whole Foods bulk food section…before hopping onto my bike for the ride back to Charleston. As soon as I started the ramp back UP the bridge toward Charleston – I realized what a huge tailwind I must have had coming in the opposite direction. The headwind that I was about to experience was pretty strong. Digital signs were flashing on the entrance ramps “Caution – Severe Crosswinds”. I know they meant “headwind”. I had to downshift to SECOND GEAR (I never downshift below THIRD gear)…in order to make the ascent….and then PEDAL HARD just to take the descent into Charleston. OK…I was lovin’ every minute! Thanks Emma. I’m feelin’ like I need to RUN today. THANKS for getting me registered in a TRIATHLON. I haven’t run in nearly 9 years since the 1999 NYC Marathon….so my pace was incredibly slow – nearly in reverse (sigh). I managed to run across the peninsula – a whopping 3 miles….of course to YET another FOOD STORE….and then walked back. The “Derrick live-aboard” situation was rapidly deteriorating. It became obvious that we had a crack-addict on board. 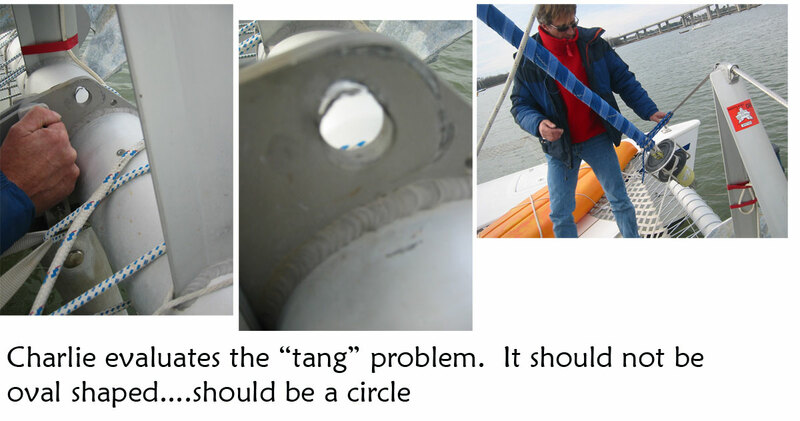 It also became obvious that he was far LESS knowledgeable about boats, than he portrayed. We were investing more and more money to fix his mistakes… It was time for Derrick to be “set free”.